So the house is decorated for Christmas and Hanukkah, and as I look around I can’t help but reflect on Chrismukkahs past. Yeah, I’m sappy like that. But it’s more that I remember where each of our decorations went in each of our old houses. For example, I have a few Christmas decorations that my mom gave me that have been in our family since I was little. I remember putting them on the end tables in our living room in our old twin house in Folsom, PA when I had to have been no older than first or second grade. Then there are the ceramic Christmas tree ornaments I painted when I was a freshman in high school. Our family was living in our house in Swarthmore at the time, and I remember I used to have to hang them from the thick branches at the top of the tree because they were so heavy. I also remember my brother used to try to sneak the first ornament onto the tree before anyone was looking. And then there were the Christmas cookies my now husband and I made when we were living in our first apartment in New York City right out of college. Or the time we bought our Christmas tree from a grocery store in Lower Manhattan that offered “free delivery,” which meant some poor employee would put the tree in a shopping cart and walk it home with you. After that we got married and bought our first home in Philly. Our Christmas cards at this point consisted of pictures of the cat in a Santa hat. 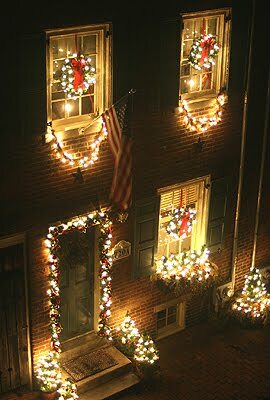 Also, we’d spent so many years in apartments that the idea of having a house to decorate kind of made us go a bit overboard with lights outside. 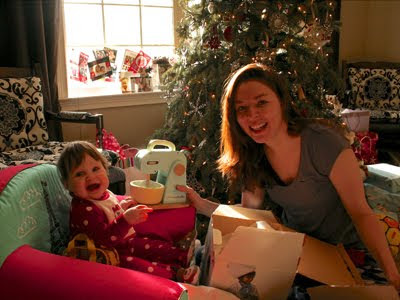 Now we’re living in our new home and getting ready to celebrate our toddler’s second Christmas. We have all the “Juliet’s First Christmas” decorations to put out that we bought last year. And, while it may sound naïve, it just struck me that this house will be a part of Juliet’s first Christmas memories. One day when she’s older, she’ll probably remember this house and these decorations as the most special Christmas memories of her life. Well, until she has a family and kids of her own. Yeah, I know, it’s a cheesy thought—cue the Lion King “Circle of Life” music—but it’s true. Motherhood makes you sappy.